My take on mac'n'cheese is a rich pasta bake where the role of cheese is played by the intensely savoury Hokkaido pumpkin. Because of its deep flavour bright orange Hokkaido pumpkin – the one shaped like an onion – has become my pumpkin of choice. (It's also known as Red Kuri squash, apparently.) For a few winters now I've been using it for this curry but also for countless puréed soups. Hokkaido pumpkins are easy to prepare because of a thin skin: peeling isn't even necessary! But make sure you get an organic pumpkin if you aren't going to peel. 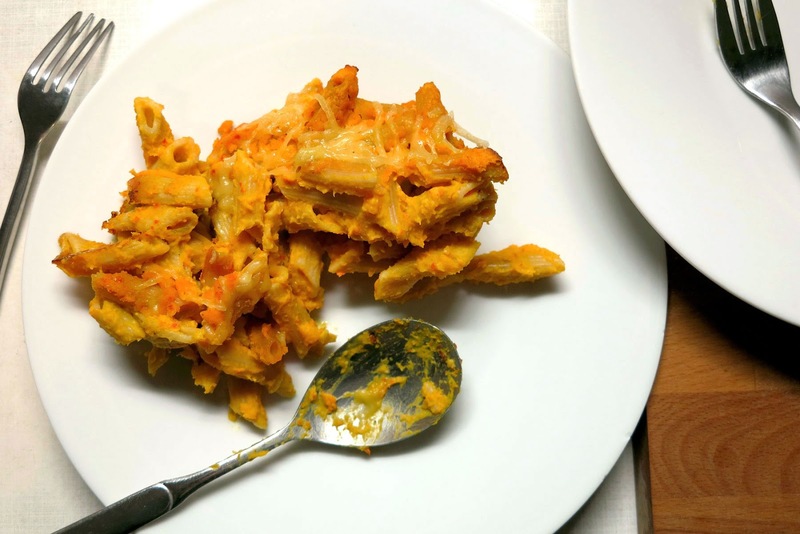 Pumpkin got paired with pasta because about a year ago I heard about an interesting vegan cheese dip made with just potato, carrot, onion, garlic, oil and nutritional yeast. After having made a good few puréed pumpkin soups this autumn the thought occurred to me that pumpkin might be even cheesier than potato and carrot, and so the experiments started. American mac'n'cheese was never a thing at my table – even less so after we left out dairy. This dish, on the other hand, delivers on all fronts: it's comforting, it's filling, it has some texture – and is actually quite healthy (you could halve the oil measurement if you're concerned). On a cold, rainy day I drench my mac'n'pumpkin with garlic sriracha sauce, and all is right in the world! Turn on the oven to 175°C. Grease a big casserole dish with margerine. Wash the pumpkin, peel off any rough parts and cut off the tips. Halve it carefully – if you're unsure you can pierce the pumpkin with your knife and then move it down on one side at a time. Don't lose any fingers! Dig out the seeds and chop the halves into about six or eight rough pieces. Place them in a pot, big enough for all the ingredients to end up in later, and just barely cover the pumpkin pieces with water. Add lentils, chopped onion and sliced garlic, sprinkle in a little salt and a splash of vinegar, and bring to a boil. Let simmer for about 10-15 minutes, until lentils and pumpkin are soft. Drain the the water into a heat-proof dish and save it as a tasty broth for later use. Measure yeast flakes, oil, vinegar, soy milk and salt directly into the pot with the pumpkin. Mix with a hand held blender until the sauce becomes completely smooth. Add the drained pasta to the sauce and fold it in carefully. Transfer everything over to a greased baking dish and sprinkle with melty vegan cheese if you like. Bake for 20-30 minutes.